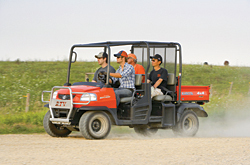 The RTV1140CPX is a transformable, four-passenger model that converts from one- to two-row seating. The vehicle allows the operator to choose between more passenger capacity or 18.4-cubic-foot cargo space, depending on the task. The vehicle features a three-cylinder Kubota diesel engine with 24.8-horsepower, four-wheel wet disc brakes, and hydraulic power steering. A hydraulic bed lift is standard on all models.